The U.S. fast-food chain 「ウエンディーズ・ハンバーガー」 (Wendy’s) opened their first store in Japan in the 銀座 (Ginza) area of Tokyo in 1980. It was operated by the Japanese department store company Daiei until the chain began losing them money in 2002…then the hamburger chain’s Japanese stores were sold to the Japanese company Zensho. Zensho owns the franchise rights to a number of restaurants in Japan. Mostly Japanese restaurants, but they also own the U.S.-based Mexican-food restaurant “El Torito Japan” and the American family restaurant “Coco’s Japan“, as well as Wendy’s Japan. Their main focus is the popular chain of 牛丼 (beef-on-rice) restaurant 「すき家」 (Sukiya). The Zensho company has been losing money with Wendy’s and has decided to end it’s franchise contract with the hamburger chain this month. So that means that by 2009 December 31, the “Wendy’s” hamburger chain will no longer be in Japan. Wendy’s is currently looking for another Japanese franchise partner so that they might be ale to re-enter the Japanese market. It reminds me of Burger King‘s experience in Japan. Burger King originally came to Japan in about 1999 but only offered a limited-menu…due to that and the fact that their prices were high compared to McDonalds, Burger King was forced to exit Japan in about 2001. But, after researching the Japanese market, Burger King reopened their stores in Japan a couple years ago. I wrote a post about some of the American and European companies that are doing business in Japan…click here to read it. 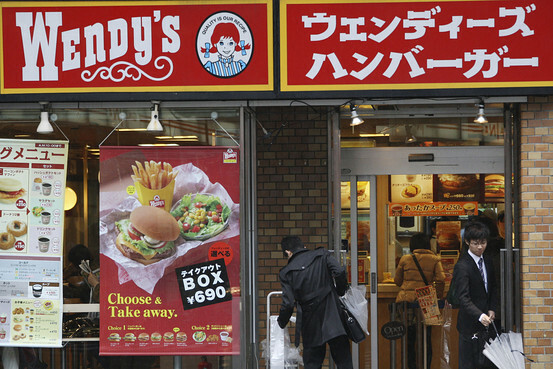 Wendy’s has announced that they’re already planning their return to Japan. So I guess Wendy’s will be back in Japan before long. I ate at Wendy’s in Kyoto, and it was the best burger from a chain I’ve ever had. The veg was fresh and crispy, the pattie was delicious and the bun toasted to perfection. The place was spotless, and while I was there, there was a worker wiping the bins and table over and over. I’m sad they’re closing. They were good. Wendy’s has left Japan…but all restaurants in Japan (even fast-food) give excellent service and products like that. When did you visit Japan? Really? Don’t they have Wendy’s in your country? At least in Japan, it is. Burger King‘s burgers are good (McDonalds seems just as good to me…but I don’t eat alot of fast-food). But I think McDonalds fries are best. This is too bad. Ever since coming to Sendai I’ve been missing Wendy’s. I guess I’ll have to get my fix in the States. >I guess I’ll have to get my fix in the States. I refused to eat Wendy’s food for years because they have square hamburgers. It bugged me. Really? Just because the burgers are square? My first job when I was 16 was at Wendy’s in Florida.